This book is nothing more than racist drivel. I'm not sure how this novel is supposed to be dystopian fantasy and/or sci fi. It purports to 'reverse racism' while, yes, it does invert today's racial heirarchies, it actually just serves to be a modern day expression of racism today. First...the blackface. Blackface is a relic of old American minstrel shows. It is considered very offensive and racially charged today. Second, and other reviewers have mentioned this, a true inversion of today's racial hierarchies would not involve calling people with white skin 'pearls' and people with very dark and/or Black skin 'coals.' Rather than an inversion, this is really an invocation of common, everday notions of beauty, where light skin is heavily prized and often seen as the most beautiful. Pearls are more beautiful than coals. It is clearly seen from the fact that one is considered a precious jewel and the other is not. The entire concept of this novel is unoriginal and trite. It is poorly executed with little sensitivity or understanding of how racism operates in the real world. Blackface is not edgy or progressive. Naming a race of people "Coal" is not a compliment. Telling us that "Pearl" is a slur does not make it so. Claiming that the world's hierarchy is dependent on skin tone does not mean that you can separate people based on race while ignoring their actual skin color. Calling your heroine's love interest a "beast" does not imply his supposed beauty and high status. Questioning the existence of an African-American community of readers will make me side-eye you damn hard. We get it--you believe that special white snowflakes always deserve to be the heroine because their lives are oh so hard. Why not just come out and admit to all the racist imagery and insulting propaganda you'll publishing? This book is disgusting. There is never a reason to make racism about white people. Repeat that as many times as you have to before it finally sinks in.Has Foyt ever heard of black pearls? If she really wanted to subvert our expectations, she could call the blacks "pearls" and the whites something unpleasant. Perhaps "spit wads" or "bird turds." Then we'd start to get the message that whites are worthless in this society. Indigenous peoples in Victoria Foyt's REVEALING EDENWriting about Foyt's book lets me call attention to the ways that Foyt (and those who like the book) are caught up in stereotypical ideas about Indigenous people. Yeah... Indigenous people are in her book, too. But they don't have a category like Coal or Pearl. They don't live in the tunnels. Instead, they're on the surface near the equator, and they're the Huaorani. Somehow, they've made it into Foyt's future, but she doesn't tell us how they were able to survive the Meltdown.And:When they land, Eden sees "a half-dozen, short, muscular Indians wearing a rag-tag assortment of clothes" (p. 50). Some have machetes, some have blowguns (and poison darts), and, "Despite fanciful feathers tucked into simple bowl-cut hairstyles, the warriors appeared fierce" as they stood by their vehicles (p. 50).So...the Huaorani are a bunch of savage warriors. You might think they, as the sole surface race, would be smarter, more advanced, more technologically savvy. Apparently not.Anyway, it turns out that the Huaorani think Bramford is El Tigre ("the Jaguar Man") who is the "long-awaited Aztec God" and because Eden is with him, they look upon her with "equal reverence" (p. 51). I guess Foyt want us to think that the Huaorani and Aztec have the same gods. Indigenous people, whether we're in North or South America...some writers think our ways are the same, no matter our location or history. Monolithic, ya' know! Interchangeable!Not only are the Huaorani primitive, they're superstitious. They worship Aztec gods even though they live thousands of miles from Mexico and the Aztec culture is mostly extinct even now. And unlike everyone else, they're too ignorant to understand the concept of a mutated human. Apparently they haven't watched Avatar or other movies available to Amazon Indians. Just like the stereotypical Indians who met the Spanish, anyone strange or exotic is a god.The Huaorani take Bramford, Eden, and her father to a village where (p. 54):Native women and children in tattered rags stood by, staring blankly at the arrivals. They looked ill with patchy hair, and red, scaly rashes on their brown skin. Their stomachs were swollen, their eyes lifeless. Two drunken men sprawled in a heap of garbage. One of them raised his head, eyed the commotion, then spit and turned over.Blank stares and lifeless eyes? This portrayal of the Huaorani isn't consistent across the novel. Here, it sounds like she's looking at a 'save the children' commercial. And drunken men?! Why is THAT there?Reese's review continues in that vein. As the movie White Man's Burden demonstrated, you don't learn much simply by reversing the races. You have to have a plausible explanation how one race came to power and continues to rule. Revealing Eden doesn't seem to have that. In this context, I don't know if blackface is bad. But how about if the "Pearls" go outside and expose themselves to deadly radiation to darken their skins? That would be more thought-provoking. Seems like Revealing Eden would've better if there were no racial distinctions at all. The ruling class could've been scientists or simply the wealthy. 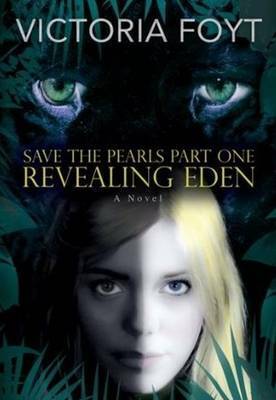 The "Save the Pearls" subtitle seems like a big unpleasant clue about where the series is headed. Indeed, the whole series seems to exist so Eden can have a "forbidden" love with a vampire werewolf were-jaguar. Where have we seen something like that before? For more of Debbie Reese's reviews, see Brave Mr. Buckingham and Hanging from Jefferson's Nose.